The China Pavilion is one of the most beautiful of the World Showcase’s countries, in my opinion. I am sharing a shot I took in August 2009, the night time made for a somewhat iffy sharpness of focus, but I really like the effect that the night time made on the sky behind the building. What do you think? China is the home of the CircleVision360 movie “Reflections of China.” This movie is somewhat dated, but that is part of what I like about the movie. When I see Reflections of China, it transports me back thousands of years. 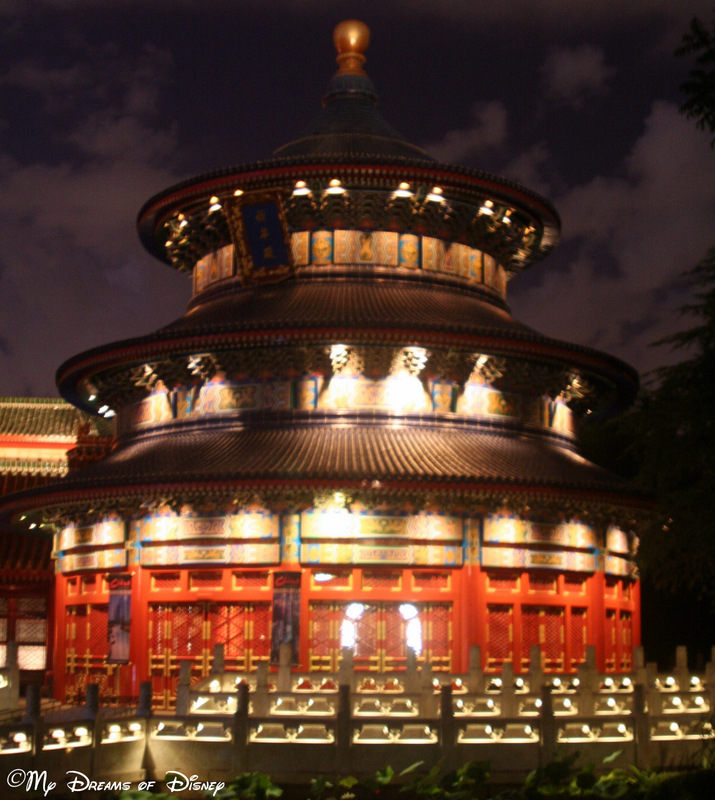 China is an original pavilion, opening on October 1, 1982, the day that Epcot opened to the public. Epcot Tuesday’s — Donald Duck! Epcot Tuesday’s — Mine, Mine, Mine!!! Overall RatingFoodServiceAtmospherePrice/ValueRomanceSuitable for ChildrenI have eaten at the Garden Grill twice in the past two years and loved it both times. The food is lovely and the iaretnction with the characters is fantastic. We first went there as a family of three (husband, son and myself) on Christmas Day 2009 and had a great time with Chip and Dale, Mickey and Pluto. All the characters interacted really well and, because it is quite small, had plenty of time to chat with us and, occasionally, each other.The most recent visit to the Garden Grill was in September 2011 for my birthday. This time my step-daughter (who was also celebrating her 25th birthday during our trip) was also with us. As my step-daughter and I were both wearing our birthday pins the characters immediately wished us happy birthday as only they can. As it was so quiet, we actually saw all of the characters 3 times! And they stopped to chat each time they came round. My step-daughter even asked Dale if he would like to come home with her and offered to leave her dad behind to do Dale’s job! Dale took my husband with him to the next table to give him some training but my husband didn’t respond well so we decided that maybe Dale should stay behind afterall.As my step-daughter and I were celebrating our birthdays, we both also got a small piece of the most wonderful chocolate cake with a candle. I thought that was a nice touch.I will definitely be going back to the Garden Grill on our next visit to WDW. Next Post: Wordless Wednesday — Animal Attractions!